Dakinis are either unenlightened or "untamed," and enlightened -- in the service of all beings for their ultimate benefit. Both kinds take any form, and their activity also, ranges in quality. There are many categories and types of enlightened dakini such as the happy set of eight each offering one of the Tibetan auspicious symbols. At www.khandro.com [no commercial relation to this site] you can see an image of one of the "offering goddesses" supporting the dharma wheel as described in the Kalachakra Tantra. In this form, she is not so much a dakini as an apsara, one of a class of nymphs at the court of Indra, king of gods. Apsaras are related to gandharvas, heavenly musicians. In the Hevajra vision,* the main (male) deity appears with at least 3 different types of females: his consort Nairatmya, various goddesses plus several dakinis. Among the latter are reddish gold Vetali in the West with a skull cup and her tortoise, black Gauri to the East with a hooked knife and her fish, green Ghasmari with a skull cup and her snake to the North, red Cauri to the South with a damaru [two-headed drum] and her boar [or bear.] The dakinis of the intermediate directions are: to the northeast, blue Pukkasi with a wheel and her lion, southeast is white Shavari with a monk and a ringed staff, southwest is a blue-black Chandali [corpse-taker/cleaner]with a wheel and a plough and to the northwest is a 4-toned Dombini [laundress/dyer] with a vajra who is making the gesture of 'fascination'. Compare the description from a version of the Bardo Thodol in which on the 12th day, they embody eight kinds of awareness. As dakinis that accompany the Herukas (wrathful compassionate activity of the 8 bodhisattvas) they are known as The 8 Kerima. They grouped into Inner [nang-gi kha'dro-zhi] or cardinal dakinis, and Outer [p'hyi-yi kha'dro-zhi] or intermediate ones. Clockwise, beginning in the east: white Kerima (bride, Gauri) with kapila (skull cup) and a corpse as a club; in the southeast: orange Pukkasi swinging entrails; in the south, yellow Chauri with bow and arrow; in the southwest, greenish black Ghasmari with dorje and raised kapala; in the west, red Pramoha with a banner of victory; in the northwest, pale yellow Chandali with a corpse and a heart ; in the north, green Vetali with kapila and dorje; in the northeast, blue-black Smashali (Smasani) wringing the head off a corpse. To someone going through the bardo, (Tibetan for interval) or the transition from life to rebirth that is called in Sanskrit, antarabhava, deities of many types including terrifying dakinis may appear. The dying person is instructed to remember that they are manifestations of Emptiness. One of these is described with spongy yellow flesh; she who eats ashes, and with whom one finds misery and suffering and a rebirth as a preta, a hungry ghost. Another is a flesh-eater who is dark with a fanged mouth and "with whom one will only find suffering and a short life" and a future in the hell realm. In the text best known as The Tibetan Book of the Dead but properly called The Book of Liberation by Hearing in the Bardo, we encounter in one bardo or intermediate state, the troma dakinis: wine-coloured Lionhead with a corpse in her jaws, black Foxhead with her razor, dark-blue Wolfhead and other projected figures such as Owl- , Raven- and Vulturehead. Bat-head Dakini Gapong Dongma, is connected with weather-making and also with exorcism (Tib. : chir-log, pron. chi-lu). Her ritual implement is a whip [ko-tum] of thin leather which is whirled during the recitation of her practice creating a characteristic whistling sound. In the mandala of Vajravarahi, Kakasya is the blue crow-headed dakini that is associated with the East . Ulukasya in the North is green with the head of a hawk. Bird-headed goddesses have existed in human consciousness since paleolithic times, and there are several in the pantheon of ancient Egypt. Svanasya, in the west is red with the head of a dog, and Sukarasya, appears in the south; she is yellow with the head of a sow.
. . . Chu srin gdong can and Seng ge'i gdong can, who, by their presence, further confirm that this is the above stated form of the goddess. Chu srin gdong can, the "makara-headed" dakini to Palden Lhamo's right, is dark blue in color and dressed in a human skin. She holds the reins of Palden Lhamo's mule in her left hand and a snare, or noose, in her right hand. Seng ge'i gdong can, the "lion-headed" dakini placed to the left of the central deity, is red in color and holds a noose, and the kapala, or skull cup. 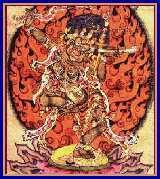 However, sometimes these zoö-cephalic [animal-headed] dakinis appear as benevolent guardians; for example, the dharma protector Simhamukha (Tib. Seng.dong.ma) or Lion-face Dakini, who roars and tosses her mane (possibly an indication of the male aspect of her origin as Padmasambhava) as she dances. One of eight attendants in the retinue of Gonpo Shanglon is Khadroi Tsomo Che Chang Mar (Mistress of Dakinis, Red Wolf-tongue.) She is also known as the Mistress of Demons, The Terrifying Red One.) Her body is bright red but she has a blue wolf's head with three large round eyes. Her orange hair is matted and disheveled. She has four hands. With the first pair she wields a curved knife and holds a skull cup to her pendulous breasts. The second pair hold a hook and a freshly- severed head with a lasso formed of intestines. She wears a single- skull tiara and her other ornaments are made of bones. In a tangka in which Bhaishajya-raja Guru (Medicine Buddha) also figures, she rides a nine-headed white bird amidst pink, green and blue clouds. Related topic: The Sow and Vajravarahi. See also the Hindu Wisdom Goddesses or Mahavidyas (N. Kumar, May 2002). * As described by Dr. Andrea Loseries-Leick for the August tangka of Hevajra in the year-2000 calendar published by Wisdom. Book of the Dead: The 1972 Freemantle and Trungpa Rinpoche translation by Shambala is still available.